Description: Quivira Council Explorer Boy Scouts receive instruction on E-10 Computer at McConnell Air Force Base. Rated Air Force instructor, name unknown, explains details of computer which the Boy Scouts use in 10-hour course on jet-aircraft navigation. Keywords: Wichita; organizations, clubs and groups; people; military; aviation. Description: View looking northeast toward downtown from Lincoln Street and McLean Boulevard intersection. Kellogg Street bridge (fourth from top) over Arkansas River dead ends at its east end. Sedgwick County Courthouse at center left under construction. Henry Levitt Arena at University of Wichita (now Wichita State University) is domed building near upper center. Keywords: Wichita, aerials, buildings, bridges, rivers. Description: Construction of Commercial Savings and Loan Association building located at 4601 East Douglas Avenue. Description: Display windows at Jenkins Music Company, 125 South Market Street, promoting store's Hi-Fi Festival. Home entertainment consoles and portable phonograph and reel-to-reel tape players featured. Photographs of disc jockeys Al Lohman and Phil Rose from Wichita radio station KFBI included in display. Keywords: Wichita, business and industry, arts and entertainment. Description: Meeting of the Wichita Chamber of Commerce. The Chamber of Commerce had its offices in the Miller Theater building located at 121 North Broadway. Keywords: Wichita; organizations, clubs and groups; people. 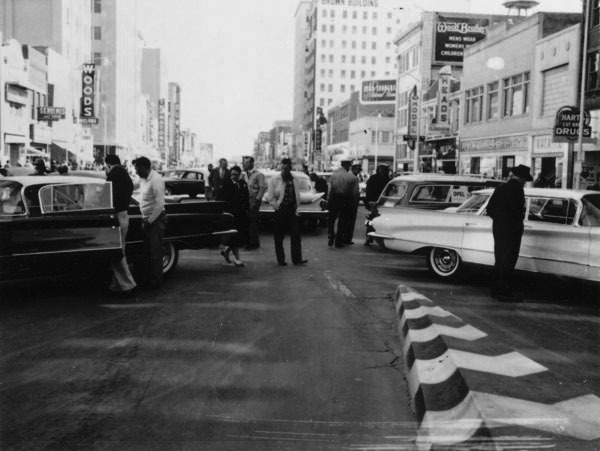 Description: New 1960-model cars on display on East Douglas Avenue. Businesses in view include, S. G. Holmes & Sons, Woods Jewelers, Lerners, Thurstons, Harts Cut Rate Drugs, Florsheim Shoes, Woolf Brothers, and the Brown Building (listed in the National Register of Historic Places). Keywords: Business and industry, street scenes, autos, transportation, Wichita.